Part of our building is over 150 years old! 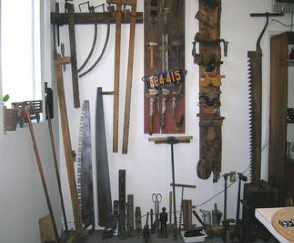 Visit us to see our antique tools collection and learn more about the history of the buildings. Building A is where our secure units are located. It was built in 2000 and has a steel frame with metal roofing and siding, which makes it flame retardant. The property is surrounded by chain link fencing and accessible through a keypad operated gate. You can find parking spaces for boats, RVs, and other vehicles in this area, too. The Whitehorse Self Storage office is in Building B, which was built in 1907 as the Madco foundry. Throughout the years, it was used by different people for a variety of purposes. When you enter our office, it will seem as if you’ve gone back in time. Hanging on the walls, stacked on the floor and leaning in the corners, are the tools of a distant past. 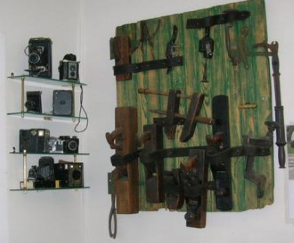 You’ll find all sorts of items, such as saws, block planes, barrel clamps, and old cameras. Collected over the years from auctions and barn sales, these tools reflect the workers who have left us such a rich heritage. You can almost hear the grunts of a farmer twisting a wood bit while he builds his barn. Or the soft whisper of the drawknife as it shapes a piece of oak into furniture. We try to remember our past while we forge our future. You'll see two-man tree saws, barrel clamps, and monkey wrenches. Also, there are two war model floor sweepers made from wood, due to the scarcity of metal during WWII. In the center, you’ll find wooden molding planes, which were used for making decorative molding to go around the baseboard of a room. There are also shoe lasts, which were used in the manufacture and repair of shoes. The large toothed saw is an ice saw that was used for cutting ice from a pond or river during the winter. An ice house was then used for cold storage of food year-round. We have early cameras, including box cameras made by Gem, Agfa, and Brownie. Additionally, there are folding cameras by Kodak and Ansco Actus. The old barn door holds various hand planes, a brace, and a nail puller. The hand planes were used to smooth the edges of boards so that they lay together closely, and the brace was used to bore holes through the wood. There is also an engine valve lapping tool used to fit valves into an engine perfectly. On the ground, there’s a 20-ton railroad jack, which was used to lift rail cars for maintenance. 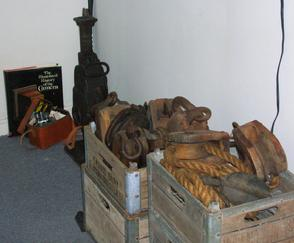 You will also find a variety of rope pulleys used in farm work for lifting hay bales in the barn. Among the items you can also observe a set of pressing irons, weighing about 10 lbs. a piece, and a very large pulley, which was probably used in an industrial setting along with a two‑man cross cut saw. Come visit us and take a look for yourself. You will love our charismatic place!